Next on The Scoop: How Much Water Should a Cat Drink? Is your cat not using the litter box? Use this checklist to see what problems are at play — and if you need to take your cat to the vet. is your cat not using the litter box? Are medical issues at play? Photography © Astakhova | Getty Images. With a cat not using the litter box, you may need to take him to a vet. Medical issues, like urinary tract disorders, are a common — and serious — reason for a cat not using the litter box. Ideally, your cat’s box should be large enough for him to comfortably turn around inside, without his body hanging over the side. You’ll need a smaller litter box for kittens and then bigger when they outgrow it. You’ll also need one with smaller sides for kittens and senior cats so they can get easily in and out of it. 3. Litter box or litter type. 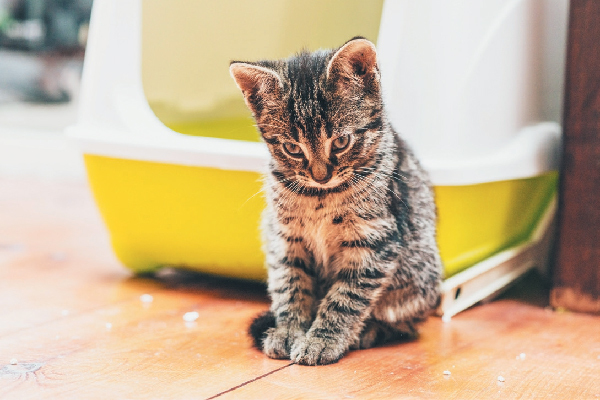 Just like us, cats have their own bathroom preferences and a cat not using the litter box might not like the type of litter or the type of litter box. Some cats like a covered litter box and other cats prefer one that’s uncovered. There are many types of litter boxes out there, so try a variety of them and find out which one your cat prefers. The same goes for litter. Cats with sensitive paws are quite particular about the type of litter they use. With all the choices, get several that work for you and your cat, and offer them in different litter boxes to see which one your cat prefers. A cat not using the litter box might have difficultly accessing the litter box. Place the litter box in a low-traffic area of your home but not somewhere difficult for your cat to reach. If you have a kitten or senior cat, put a box on every level of your home, so he can get to a box quickly and easily. Household changes can quickly cause stress in your cat, and peeing outside of the litter box is commonly the first sign. Adding new people or pets to the household is a common cat stressor. 6. Not enough boxes — or not clean enough. If there aren’t enough boxes in a multi-cat household, or if they are not scooped often enough, your cats will find another, cleaner place to go. And I guarantee it won’t be someplace you’ll like. Scoop your litter boxes often, at least twice a day, and offer the same number of boxes as you have cats and one extra. 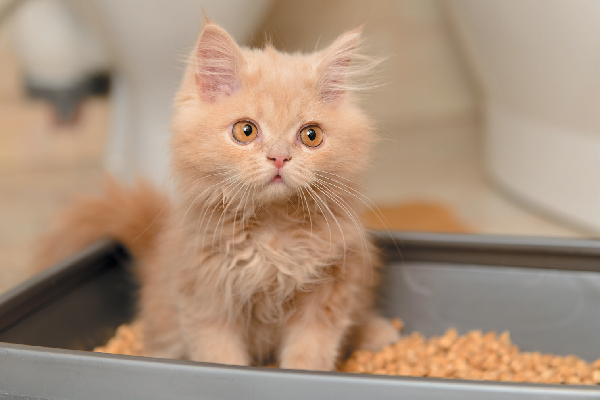 Tell us: What litter box issues have you encountered? What are your tips for a cat who’s not using his litter box? Rita Reimers’ Cat Behavior Coaching has helped many cat owners better understand their feline friends. Visit RitaReimers.com to read her cat behavior blog or book a cat behavior coaching session. Rita is also CEO/owner of JustForCatsPetSitting.com. Connect with her on Facebook and on Twitter at @TheCatAnalyst. A few years ago we adopted a mom cat and 2 of her kittens. We only had one litter box. Within a month the mom cat started peeing on our couch of all places. We thought she was sick so we took her to the vet. He found nothing wrong with her, but suggested trying a second litter box. We had no good place to put it, so my wife put a second box right next to the first one. It was only used once or twice, but that completely solved the pee on the couch. I guess Annabelle just wanted to know she had her own box, even if she didn’t use it. Hello from Oakland, California! I have some major issues going on with my feline family. I recently “rescued” a < two month old kitten, which I found only slightly conscious in a 6×4 plastic water dish I keep outside for the feral cats that reside around my apartment building. Very long story short: I brought him inside and-my already dreadful financial situation be damned!-was able to get him to the Vet's office and have him treated effectively. He seems to be thriving aside from his relationship with my other cat, Tammy, who is just short of six years. I adopted Tammy at three years of age and she has known nothing but kindness, love, and a quiet and safe home. So naturally I was shocked when I slowly introduced Razumikihin (the male kitten) to her and she began hissing violently and has even tried to attack him on more than one occasion Zoomie (short name for the kitten) has become attached to me and especially likes my bed, which Tammy likes as well. So I have (I think) two cats peeing all over my bed, perhaps on the carpet in my bedroom, I'm not sure; I am sure, however, that it is confined to my bedroom. As if things weren't bad enough, I'm having to utilize those pricey washers to wash bedding nearly every day, as I only have three sets of sheets and two comforters. There really is no way to lock them out of the room for reasons too pedantic to explain here. Tammy's attitude seems to be deteriorating daily; she even hissed and scratched at me for the first time since I have been her guardian and already spoiled as it were, she turns her nose up at everything I give her. Just yesterday I had four different kinds of food in front of her, of which she ate none. So I'm at the end of my rope. I desperately want this situation to work, but I am deeply concerned. Zoomie has his own private space with a litter box, as does Tammy. They are fed separately in separate locations. Please, someone, tell me what I am doing wrong and, of great importance too, what is the best way to stop the urination and likewise eliminate the lingering smell that hangs in the air like humidity, seemingly forever? Thanks in advance, A.W. Thank you so much for the links. Last night went a little better so I am keeping my fingers crossed. OMG, my cat does the exact same thing. When you find out why and what please let me know. Try using a covered litter box. I found that my male cat would sometimes miss the litter box and it doesn’t happen anymore. My female cat stands in the litter box with her front paws on the side, while she does her business, and I’m finding that she urinates on the floor beside the box. I have started putting a pet training pad under the box to absorb the urine. Why is this happening?